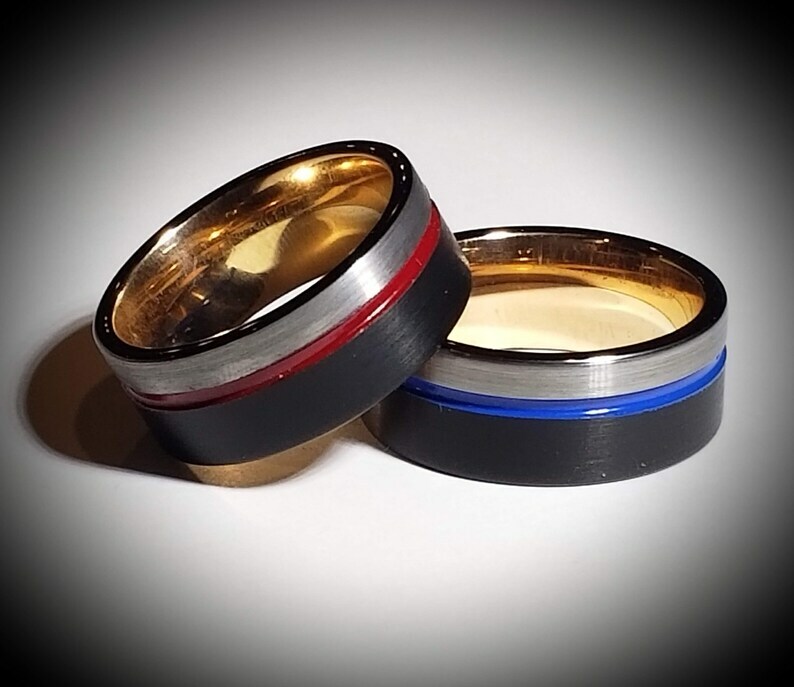 Personalize Your Ring with an Engraving! Engrave up to 25 Total Characters, Numbers, Spaces, or Symbols (IE. Heart or Cross). Note that on Tungsten, the only two font options are Arial or Times New Roman. If you don't request the font of your choice, the default font is TNR. Created for first responders who know exactly what it means to tow the red line or walk that thin blue line, Law Enforcement Officers, Military Police, Fire Fighters and other first responders will be in awe of this piece of art hand crafted specifically for them by a retired military vet and former federal officer who does this for our wounded vets where the majority of the proceeds are donated to through the Wounded Warrior Project (WWP) to get the extended medical treatment, therapy, rehabilitation and re-vocational training to return to the civilian lifestyle they so deserve. They gave all for us and deserve our heart felt love and appreciation for their sacrifice. I just love this band, it has such an fashionable rich look to it yet extremely sturdy, strong, scratch and ding resistant. Being made from solid Tungsten Carbide it has a nice feel and weight to it over that of the much lighter Titanium. Perfect for every day wear or a nice night out on the town. This makes a seriously nice wedding band and while made to be unisex, it is certainly a mans favorite! IMPORTANT NOTE: I'm only selling the first three of these at this incredible price as an introduction to get a few start up feedback reviews here but after the next couple sold the price will go back to $295 which is what I normally sell this band for. Sale will be ending soon. 3. Other color? Just ask. (Note that this is not a simple paint inlay but rather the color is a high quality powder coating baked at 450F into the ring which is the same process done for custom rims, motorcycle frames and race engines meaning it is made to put up with a lot more punishment and last much longer than standard paint which would just fade). - Free Elegant Jewelry box for presentation and protection of the ring. - Perfect Gift for Christmas, Birthday, Anniversary, Wedding, Engagement, or Valentine's Day Gift.